I sent an email to the council about the festival and at the time of writing, I’m still awaiting a response. There is literature about how decisions are made by authorities; they go on about how in a democratic society consultation engagement is important. Regarding the festival, Subiaco council missed that and went straight to announcing. Has this council no shame? It is supposed to be serving the ratepayers, not assuming some moral higher ground and deciding what is best for the people. I’m aware that maybe not everyone wanted a festival and I respect that. However, this festival has happened for many years and at the last minute, the council pulls the rug. There was no serious consultation about this, no engagement. If we apply to put a small extension on our house we have to jump through hoops, yet a decision like this is made and I’m not aware of any discussion or public engagement. Our beautiful suburb and our community are slowly losing their personality and heart. They are part of the reason many of us moved here. Rokeby Road’s vibrancy and community is just as much a part of the fabric of Subiaco as are the leafy and beautiful streets. I suggested the chief executive and some of his team take a late-afternoon or early-evening trip to Leederville one sunny Saturday to get a flavour of what is happening. It is vibrant; it’s got life, it has businesses, it has no empty shops. Then come back to Subi: listen to the crickets, walk up the street and count the empty shops or the shops closed due to restrictive hours, or no licensed outlets within a stone’s throw of Hay Street/Rokeby Road junction. 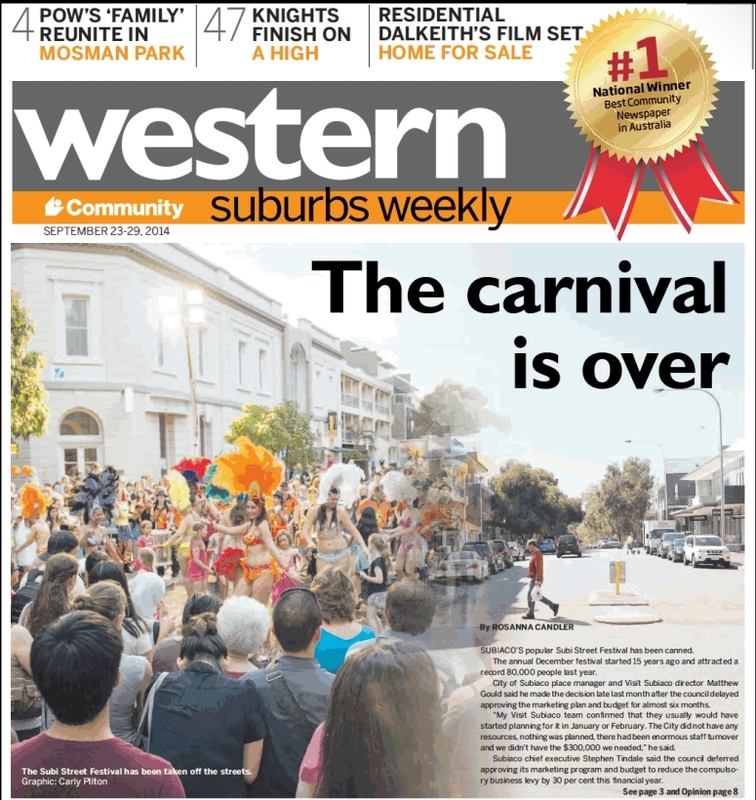 Alternatively, compare the Leederville festival, which is only a few years old. It is growing, it is great for the suburb and it provides local businesses and food outlets an opportunity for a bumper day.